Today Beck Pitt and I travelled up to Birmingham in the midlands of the UK to attend a BERA/Wiley workshop on technologies and ethics in educational research. I’m mainly here on focus on the redraft of the Ethics Manual for OER Research Hub and to give some time over to thinking about the ethical challenges that can be raised by openness. The first draft of the ethics manual was primarily to guide us at the start of the project but now we need to redraft it to reflect some of the issues we have encountered in practice. Things kicked off with an outline of what BERA does and the suggestion that consciousness about new technologies in education often doesn’t filter down to practitioners. The rationale behind the seminar seems to be to raise awareness in light of the fact that these issues are especially prevalent at the moment. The latin part of the title of this presentation means ‘do no harm’ and is a recognised ethical principle that goes back to antiquity. Jameson wants to suggest that this is a sound principle for ethical leadership in educational technology. After outlining a case from medical care Jameson identified a number of features of good practice for involving patients in their own therapy and feeding the whole process back into training and pedagogy. 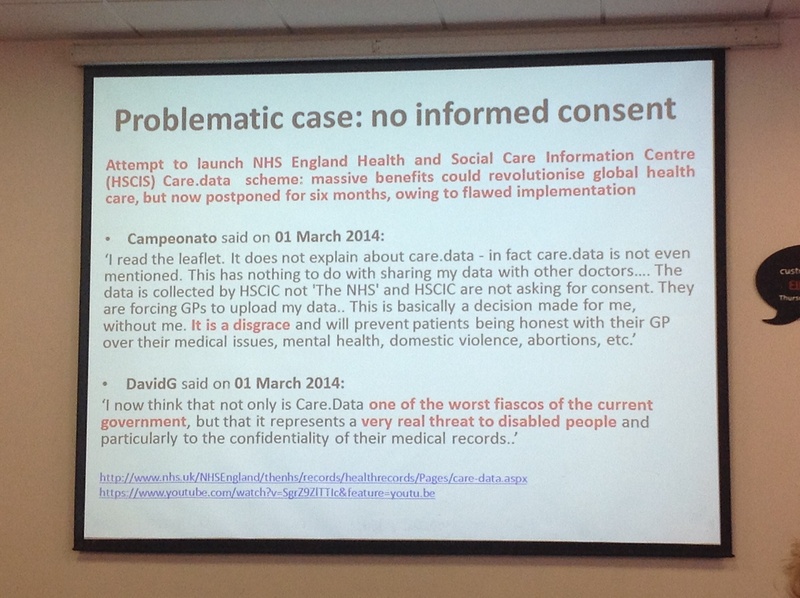 This was contrasted with a problematic case from the NHS concerning the public release of patient data. Arguably very few people have given informed consent to this procedure. But at the same time the potential benefits of aggregating data are being impeded by concerns about sharing of identifiable information and the commercial use of such information. In educational technology the prevalence of ‘big data’ has raised new possibilities in the field of learning analytics. This raises the possibility of data-driven decision making and evidence-based practice. It may also lead to more homogenous forms of data collection as we seek to aggregate data sets over time. Leadership is thus needed in ethical research regarding the use of new technologies to develop and refine urgently needed digital research ethics principles and codes of practice. Students entrust institutions with their data and institutions need to act as caretakers. I made the point that the principle of ‘do no harm’ is fundamentally incompatible with any leap into the unknown as far as practices are concerned. Any consistent application of the principle leads to a risk-averse application of the precautionary principle with respect to innovation. How can this be made compatible with experimental work on learning analytics and sharing of personal data? Must we reconfigure the principle of ‘do no harm’ so it it becomes ‘minimise harm’? It seems that way from this presentation… but it is worth noting that this is significantly different to the original maxim with which we were presented… different enough to undermine the basic position? 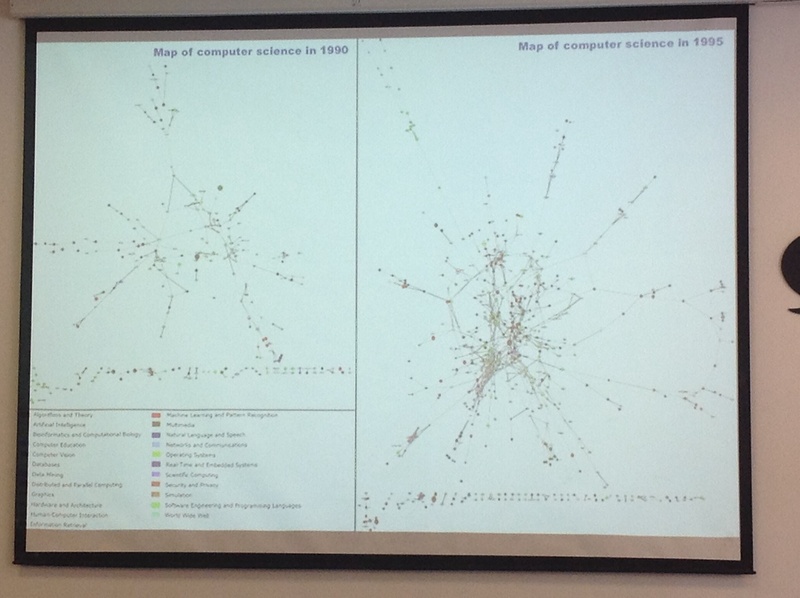 Klamma started in earnest by showing us some slides: Einstein sticking his tongue out; stills from Dr. Strangelove; Alan Turing; a knowledge network (citation) visualization which could be interpreted as a ‘citation cartel’. The Cold War image of scientists working in isolation behind geopolitical boundaries has been superseded by building of new communities. This process can be demonstrated through data mining, networking and visualization. From a publisher perspective, there is much interest in the ways that research data is shared. They are moving towards a model with greater transparency. There are some services under development that will use DOI to link datasets and archives to improve the findability of research data. 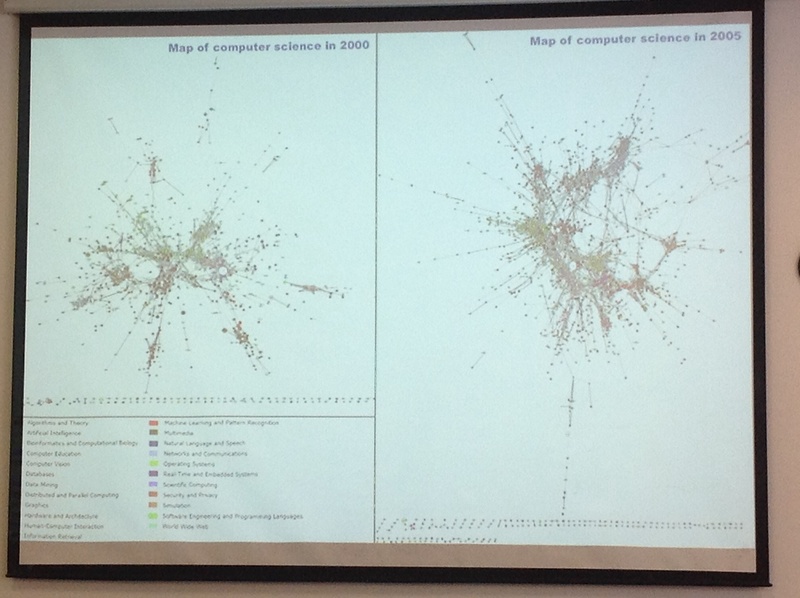 For instance, the Geoscience Data Journal includes bi-direction linking to original data sets. Ethical issues from a publisher point of view include how to record citations and accreditation; manage peer review and maintenance of security protocols. Data sharing models may be open, restricted (e.g. dependent on permissions set by data owner) or linked (where the original data is not released but access can be managed centrally). Data can be defined by three Vs: variety, velocity, and volume. (Options for a fourth have been suggested.) 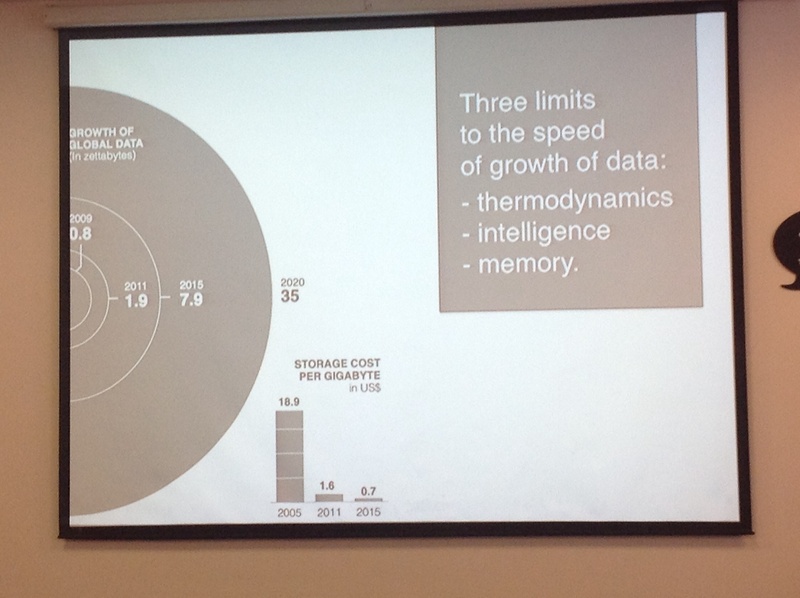 Data has seen a massive explosion since 2009 and the cost of storage is consistently falling. The only limits to this process are thermodynamics, intelligence and memory. 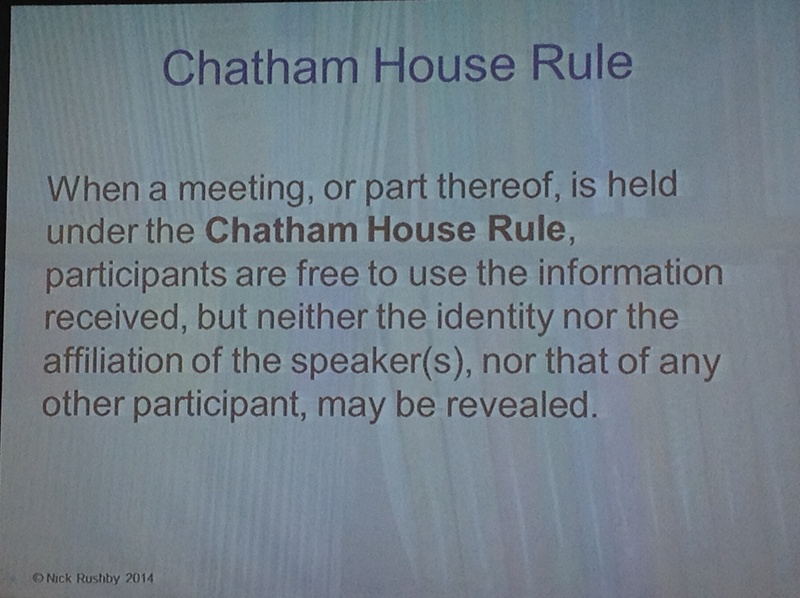 This process is to some extent restricted by legal and ethical issues. Epistemological Problems with Big Data: ‘big data’ has been with us for a while generally should be seen as a set of possibilities (prediction, simulation, decision-making, tailoring, deciding) rather than a problem per se. The problem is rather that data sets have become so large and complex that they are difficult to process by hand or with standard software. Ethical Problems with Big Data: the challenge is actually to understand the small patterns that exist within data sets. 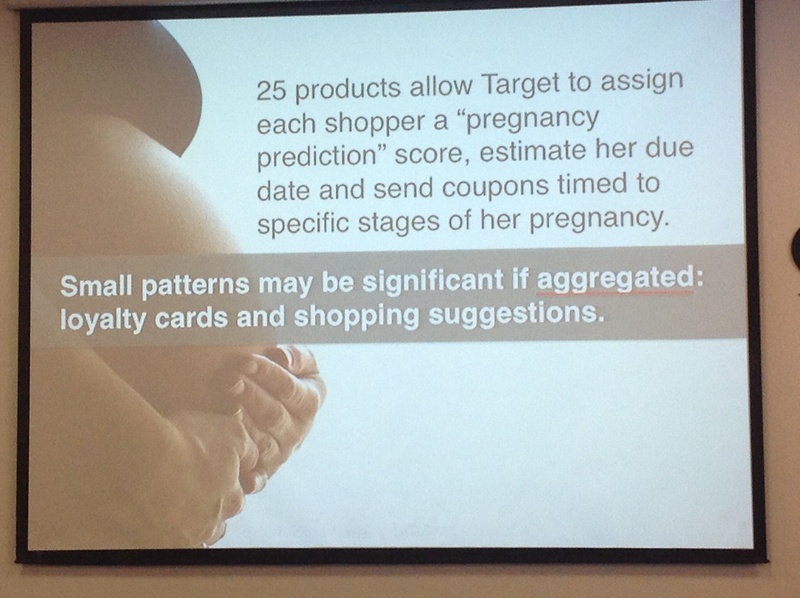 This means that many data points are needed as ways into a particular data set so that meaning can become emergent. Small patterns may be insignificant so working out which patterns have significance is half the battle. Sometimes significance emerges through the combining of smaller patterns. Thus small patterns may become significant when correlated. To further complicate things: small patterns may be significant through their absence (e.g. the curious incident of the dog in the night-time in Sherlock Holmes). Floridi advances the claim that the ethical value of data should not be higher than the ethical value of that entity but demand at most the same degree of respect. 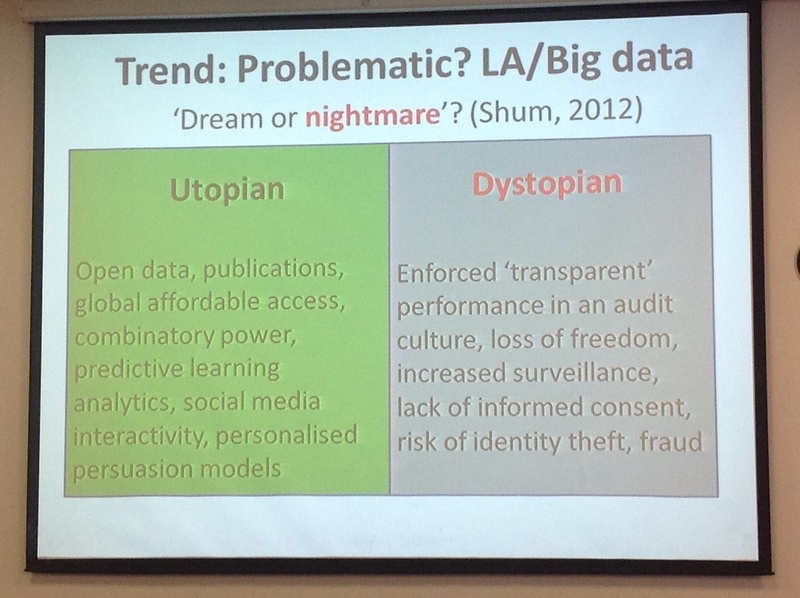 Putting all this together: how can privacy be protected while taking advantage of the potential of ‘big data’?. This is an ethical tension between competing principles or ethical demands: the duties to be reconciled are 1) safeguarding individual rights and 2) improving human welfare. If yes, can groups hold a right to privacy? How does group privacy relate to individual privacy? 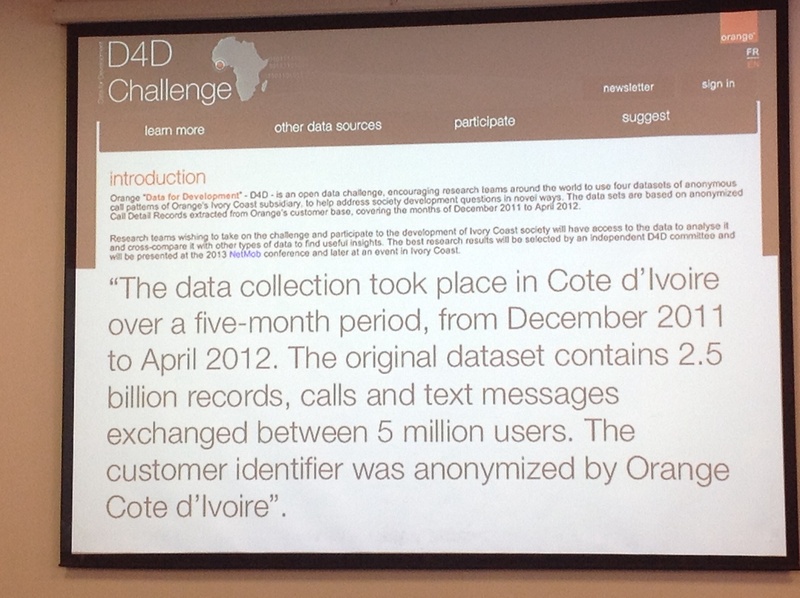 The risks of releasing anonymised large data sets might need some unpacking: the example given was that during the civil war in Cote d’Ivoire (2010-2011) Orange released a large metadata set which gave away strategic information about the position of groups involved in the conflict even though no individuals were identifiable. There is a risk of overlooking group interests by focusing on the privacy of the individual. There are legal or technological instruments which can be employed to mitigate the possibility of the misuse of big data, but there is no one clear solution at present. Most of the discussion centred upon collective identity and the rights that might be afforded an individual according to groups they have autonomously chosen and those within which they have been categorised. What happens, for example, if a group can take a legal action but one has to prove membership of that group in order to qualify? The risk here is that we move into terra incognito when it comes to the preservation of privacy. Generally speaking, it’s not enough to simply get institutional ethical approval at the start of a project. Institutional approvals typically focus on protection of individuals rather than groups and research activities can change significantly over the course of a project. In addition to anonymising data there is a case for making it difficult to reconstruct the entire data set so as to stop others from misuse. Increasingly we don’t even know who learners are (e.g. MOOC) so it’s hard to reasonably predict the potential outcomes of an intervention. The BERA guidelines for ethical research are up for review by the sounds of it – and a working group is going to be formed to look at this ahead of a possible meeting at the BERA annual conference.